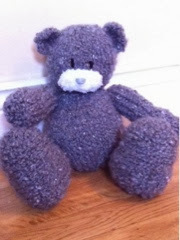 A customer asked if I could knit a Tatty Teddy for her grand-child.Here is my first attempt, without any embellishments. I now need to try size it up. He's about 8" but she asked for one about 12". 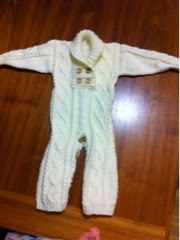 Found the pattern for this on Ravelry (sorry, no link as I'm doing this post via my phone!). The pattern is bi-lingual, French and English. The knitting part is written pretty well but the making up instructions are pretty sparse so it's definitely not a pattern for beginners. 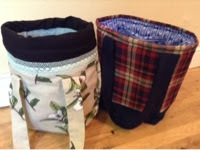 Two bags made, one using one of the tea towels, the other using one of DH's old shirts! I wonder which one she'll choose? I made good use of the free lace from my sister in law too. Some of it was the perfect shade of minty-green to match. The lady who runs the choir I sing with asked if I would make her a bag. I'd made one for her back around Easter, but she wants another, more wintery, bag.I found this tea towels in the local supermarket. €7 for the three. I think they could make a very nice bag - or two. I knit this from a pattern I found on Ravelry. 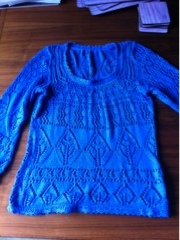 I used Aldi Aran weight yarn and 6.5 mm needles. It's beautifully squishy and soft. It's for a friend for Christmas, but I want one for me too now. And so does DH! Every time I'm at the sewing machine these days Oliver is over asking if what I'm making is for him. So after finishing a few dresses I decided to make a waistcoat for him. 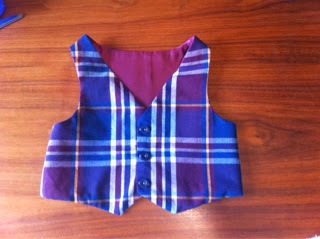 It's made from one of DH'snold shirts and is modelled on a H&M waistcoat Oliver got last Christmas. Think it turned out pretty cute! 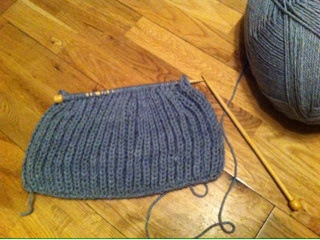 I started knitting a scarf last night in brioche stitch. 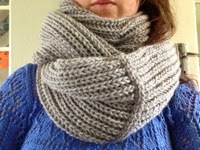 Some easy knitting for the evenings.I love it - so soft and squishy. 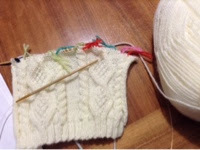 Kinda want to knit everything in brioche stitch now! Had a fairly disastrous day at the market on Sunday, but it means the pressure is off for the next one. Every cloud! This week has been mostly about catching up on housework. 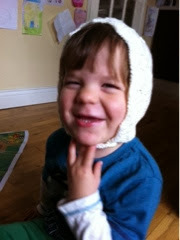 I have taken time out though, of course, to knit a new bonnet for my niece. Her mother loves them as they stay on and fit nicely. A nice navy one this time to go with her mustard yellow winter coat. Should be cute! P.s. 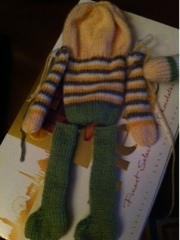 the knitted doll will be released as a pattern at some stage but probably not til December. Need to get the markets out of the way first! For my god-daughter for her 7th birthday. Hope she likes it! I know I posted a picture of this weeks ago - apologies for the delay to anyone waiting on it. This pattern is sort of a recipe. I've written out the basic body and the instructions for all the embellishments - hats, skirts, etc. You can then go ahead and add your own colours, spots, stripes, whatever! It's definitely one to have fun with. DH took the kids out this afternoon to give me a break, so I got some typing of patterns done. 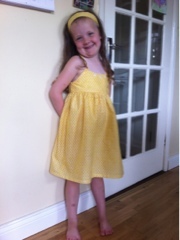 For sale now is 'The Sleepy Princess', just 3 euro of the pattern. 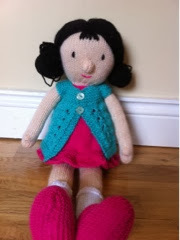 The finished doll is 14" tall, and she's lovely and soft. Perfect for taking to bed. 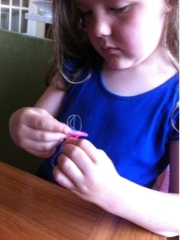 Seems to be happening rather frequently at the moment, but I am out of toy stuffing again. Will have to go on a shopping trip tomorrow! Sales are going well at the shop over in Dun Laoghaire. 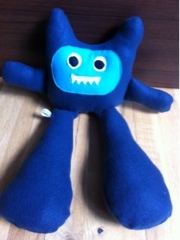 And now I have the opportunity to sell some stuff in www.siandlu.com 's bricks and mortar store in Rathmines. So I'm trying to come up with a few quick and easy toys to fit in with their aesthetic. 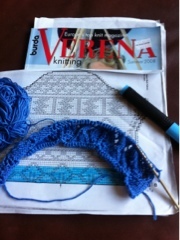 And write up a few new patterns while I'm at it! Forgot to actually show a picture of my finished jumper! 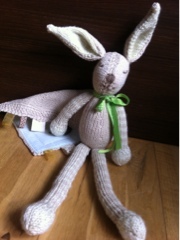 It's knit with some bamboo/acrylic mix from Lidl and is quite heavy now it's finished. Feels nice to wear. And I love the lace. Personally I'm not too keen on sleeve that flare out at the bottom but as these only come to my elbows they don't get in the way too much. If I was doing it again I'd cut out the flare bit. I also had a bit of an issue with the crochet borders. 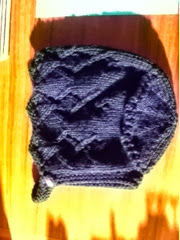 The stitch count seemed way too small and pulled in the knitting too much, making it too tight. Do I just crocheted something that felt comfortable to wear and went from there. Worked out okay in the end. Poor Emily got sick at her friend's party today and had to come home early. 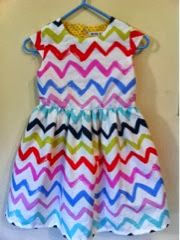 So while the poor thing lay on the couch watching a LaLaLoopsy movie I whipped up a little dress for her LaLaLoopsy doll. Completely fudged this. Just started crocheting and ended up with this. I must learn to write crochet like I can with knitting so that I could share little patterns like this. 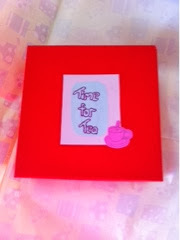 I'm taking some time this week to make something for me, something nice! I've had this magazine for 5 years and made nothing so thought I'd give a nice lace-y jumper a go. I've never knit a garment from a chart like this so it was a bit daunting at the start but I think I have the hang of it now. I've the back and front done so just the sleeves and edgings left. Although that'll probably take another week - bloody sleeves always seem to take so long! It's for our next-door-neighbours, who just had their second kid, another little boy. 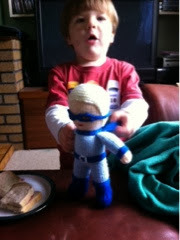 I also made a crochet robot for the little baby's older brother, who is 2. The skirt's a bit long, but it just adds to the drama! Getting ready for a market this Sunday at a charity event so trying to get a bit more sewing in over the last week. 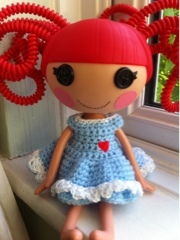 And some more Rag Dolls. Hope the dreadful rain we've been getting lately eases off for the day! 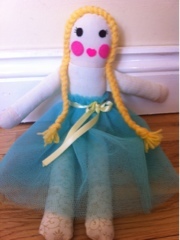 Mini Fairy - just 3 inches tall when complete and only takes 1-2 hours to make. For Emily! With a matching headband. That made her pretty happy! I have a new apprentice! Pretty good for 5 years of age. It was a very fun project to work on and I'm glad to say they made it to Scotland unharmed - I'm always a little apprehensive sending stuff I've spent hours working on off in the post. The dolls were to be similar but different so I selected one colour for each from the flower-y fabric, which is the fabric for the flower-girls' dresses. 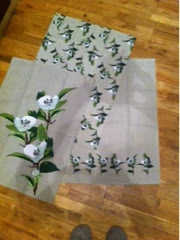 Each skirt is embroidered with the name of the flower-girl and the date of the wedding. Just wish I'd thought of this idea for my own wedding!